ARE EVANGELICAL CHRISTIANS; EXTREMIST, HATE GROUPS? Are evangelical Christians rapidly becoming one of the most hated minorities in America? Once upon a time such a notion would have been unthinkable, but these days things are changing dramatically. All over the United States, evangelical Christians are being called "extremists" and evangelical Christian organizations are being labeled as "hate groups". In fact, as I will detail later on in this article, a U.S. Army Reserve training presentation recently specifically identified evangelical Christians as "religious extremists" This should be extremely chilling for all evangelical Christians out there, because as history has shown us over and over again, when you want to persecute a particular group of people the first step is always to demonize them. And that is exactly what is being done to evangelical Christians today. Just look at how evangelical Christians are being portrayed on television and in the movies. Just look at how much hate is being spewed at Christians on the Internet. The Southern Poverty Law Center and the ACLU, both of which are considered to be among the most prominent "civil rights" organizations in the United States, are seemingly obsessed with attacking evangelical Christians. 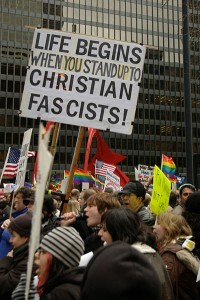 It has become trendy to bash Christians, and that is a very frightening thing. After they have finished demonizing evangelical Christians, what will the next step be? 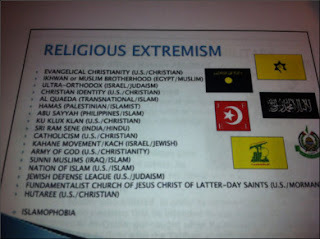 A U.S. Army Reserve equal opportunity training presentation entitled "Extremism and Extremist Organizations" actually included "Evangelical Christianity" as an example of "Religious Extremism" in a list that also included al-Qaeda, Hamas and the Ku Klux Klan. You can find a copy of the entire presentation right here. Here is a photograph of one of the slides presented at the U.S. Army Reserve training presentation. As you can see Evangelical Christiantiy(U.S./Christian) is at the top of the list in this overhead slide presentation presented to U.S Army Reserve Troops. 1 A student at Florida Atlantic University was recently suspended from class for refusing "to write the word 'Jesus' on a piece of paper, fold it up, and step on it." 2 A 14-year-old homeschooler in Maryland received multiple death threats after testifying in favor of traditional marriage before the Maryland state senate. 3 A 14-year-old student at a public school in Texas was suspended from school for saying that he believes that homosexuality is wrong. The group that allegedly smashed up a Portland church hopes its "small act of vengeance will strike fear into the hearts of" Christian leaders who teach traditional sexual morality, according to an e-mail message the group released to the public. A group calling itself "Angry Queers" has claimed responsibility for throwing baseball-sized rocks through nine church windows in Portland’s Mars Hill Church, including two 100-year-old stained glass panes. 5 A high school teacher in Oregon was recently escorted from his school by police for objecting to the presence of Planned Parenthood in the school. Pro-homosexual activists attacked the Christian Liberty Academy early October 15th - throwing two large, concrete brick pavers through its glass doors with a hate-note attached- and then issued an online statement claiming responsibility for the crime. The attackers demanded that CLA "shut down" a banquet it was hosting later that evening for the "homophobic hate group," Americans For Truth About Homosexuality (AFTAH). 7 All over the country people are being fired from their jobs for expressing their belief in the Biblical view of sexual morality. "I did pretty much the same thing: I preached about twenty minutes, and I handed out a few tracts," Johnson explained. "[W]hen I got in my car to leave, and as I was getting ready to start the car, the police zoomed up and turned on their lights, and told me to get out of the car." "They pretty much said the same thing," he continued. "They said, 'You're not supposed to raise your voice or scare anybody and tell people they're going to die.' I said, 'Well, what if that building's on fire and I raise my voice and tell people if they don't leave, they’re going to die? Is that wrong?'" Anyone that is familiar with any of those groups knows that they are absolutely not hate groups. In fact, they are filled with tremendously loving people. The people that make up organizations such as those are the backbone of America. But these days there are many liberal organizations that will label anyone that does not agree with them as a "hate group" at the drop of a hat. The truth, of course, is that all of those individuals and organizations are deeply patriotic and are trying to turn America around. It is the SPLC that is the one that is filled with hate, and they clearly have a very deep hatred for anyone that does not agree with them. About 100 million Christians are persecuted around the world, with conditions worsening for them most rapidly in Syria and Ethiopia, according to an annual report by a group supporting oppressed Christians worldwide. Open Doors, a non-denominational Christian group, listed North Korea, Saudi Arabia and Afghanistan as the three toughest countries for Christians last year. They topped the 50-country ranking for 2011 as well. Persecution of Christians is on the rise, and it is probably only going to get worse in the years ahead. Remember what happened in Nazi Germany. There was a long program of demonization against the groups that the Nazis hated before they ever started to round them up and take them off to camps. In the end, those that are now demonizing evangelical Christians will not just be satisfied with calling them names. They ultimately want much more, and what we are witnessing now is just the warm-up act. Jesus tells us in his word that there would be a great falling away from the truth, the great apostasy before his return. Jesus also told us in the book of John to expect persecution for our faith. "If the world hate you, ye know that it hated me before it hated you. If ye were of the world, the world would love his own: but because ye are not of the world, but I have chosen you out of the world, therefore the world hateth you. John 15:18,19 KJV. Why should we be any different then Christians who have suffered greatly, even martyred for their faith. All of the apostles with the exception of John were murdered for their faith. During the 16th century war followed war, tortures, burnings and massacres occured before and during the Reformation. During the time of the Roman empire and even before, Christians were thrown to the lions and made sport of in huge coliseums. Just because we live in America don't think that we are immune to history. The Lord has blessed this country mightily but we have turned our back on him by killing over 53 million infants in the womb. Now some of our political leaders are even saying that this is permissible up to age three. Homosexual marriages are being forced down our throats. These acts are abhorrent to God. Surely we will be judged. I do not think that things will improve if history is to repeat itself. We must get down on our knees and appeal to an almighty, all knowing, all powerful God; that he will turn the tide to bring this nation back from the precipice. "If my people, which are called by name, shall humble themselves, and pray, and seek my face, and turn from their wicked ways; then will I hear from heaven, and will forgive their sin, and will heal their land. II Chronicles 7:14 KJV.